Increased Wear Resistance, Improved Traction. 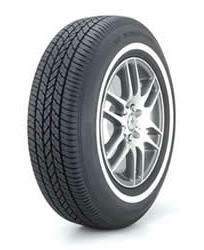 Modern manufacturing technology - computer-designed tread pattern combined with special all-season tread compound - delivers a longer-lasting tire. Better Handling, Greater Durability. Tread area is supported by two steel cord belts that provide additional strength for better handling. Confident, Comfortable Driving. Polyester cord body boosts reliability and ensures a smooth, comfortable ride.